Foxes like chickens, according to cartoons I have watched in my squandered youth. It’s Fox’s birthday! Happy birthday, Foxy! I made him this Foxy play set, which includes 1 fat little fox, 1 splendid otter, 1 roast chicken, 1 green salad, 1 mushroom pizza (he was so confused last week when I sent him an email that just said, “What’s your favorite kind of pizza?”), 1 gallon of whole milk, and 1 birthday cake. We’re going to have a real life picnic of Jamaican takeout and I will give him this present and maybe even bring 3D Dragon with me, so our alter egos can have a picnic too. I probably could not ice a real cake so beautifully. My real life chickens look a little bit better, though. Normally I wouldn’t post pictures of his present online until after he received it, so as not to spoil the surprise, but the odds are against him reading this blog before I see him. This entry was posted in 3D, Uncategorized and tagged 3d, chicken, fox, milk, pizza, polymer modeling clay, salad, Sculpey on December 10, 2015 by littledragonblue. Not to brag, but when the Man read this comic, he laughed out loud, and he considers himself a real arbiter of comedy. Don’t try this at home. Unless you are a fire-breathing dragon. And your home is asbestos. There’s one more Dragon comic in the works for tomorrow; probably not quite ready to commit to daily webcomics, although I hope to do so someday. But this has been a very encouraging experiment, and Friday’s comic will not be the end of Dragon’s quest to draw. 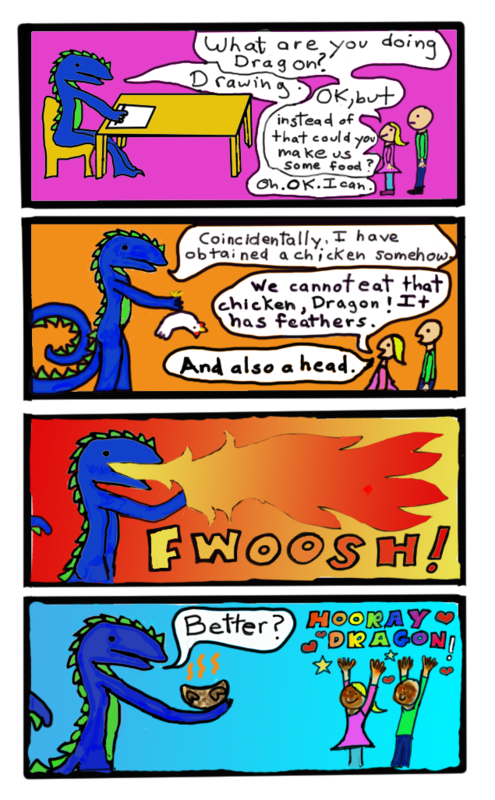 This entry was posted in Comics, Dragons and tagged chicken, comic, comics, cooking, dragon, kids, web comics on August 21, 2014 by littledragonblue.